NYC Police Officer Found Guilty Of Manslaughter In Shooting Of Unarmed Man : The Two-Way In 2014, a rookie police officer fired his gun in a stairwell. His bullet ricocheted off a wall and hit Akai Gurley, 28, on a lower floor. 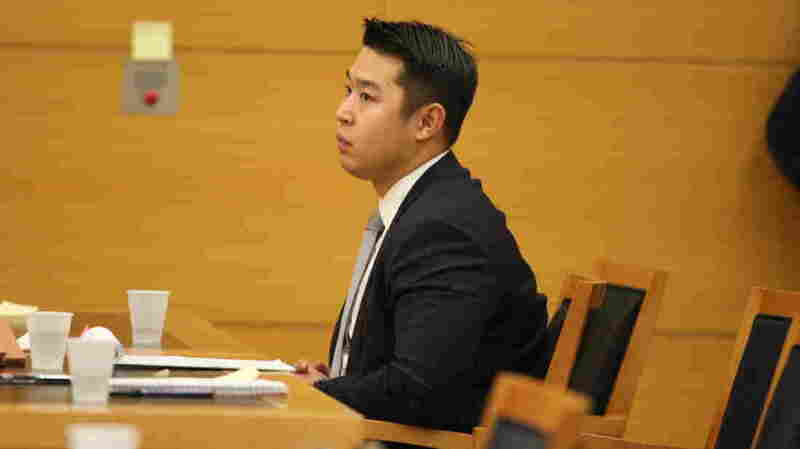 New York City police Officer Peter Liang sits in court as testimony is read back for jurors during deliberations in Brooklyn Supreme Court this week. A jury in New York has convicted NYPD Officer Peter Liang of manslaughter over his shooting of an unarmed black man in a dark stairwell in 2014. Liang, who was a rookie at the time, was also faulted for not aiding his victim. The verdict was announced Thursday night; soon after, the NYPD announced that Liang has officially been fired from the police force. "The rookie officer was patrolling the stairwell with his gun drawn in 2014 when he fired. The bullet ricocheted off a wall and hit 28-year-old Akai Gurley on a lower floor. "Prosecutors said Liang handled his gun recklessly and did almost nothing to help Gurley. "The 28-year-old Liang said he fired by accident after a noise startled him. He acknowledged not helping Gurley's girlfriend try to revive him, but Liang explained he thought it was wiser to wait for professional medical aid." Gurley was in the Brooklyn public housing complex to have a friend do his hair before heading out on a Thanksgiving trip with his fiancée and their two children, BuzzFeed has reported. They planned to take the bus to Florida the next day to visit Gurley's mother. The prosecution of Liang has been closely watched, in part because the case arose amid a string of high-profile police killings of unarmed black men. Gurley was shot four months after Eric Garner died in Staten Island, N.Y., and three months after Michael Brown was shot and killed in Ferguson, Mo. "There's nothing in the world that can heal my pain, my heartache," Gurley's mother, Sylvia Palmer, told WNYC in 2014. "I pray to God I get justice for my son because he didn't deserve to die like that." After the verdict, Gurley's aunt Hertencia Petersen told the New York Daily News, "We're not rejoicing." She added, "But it's about being accountable. It's about a girl who will never know her father." Liang's sentencing hearing is scheduled for April 14.